last week I mentioned that I was on jury duty. since it took up so much of my time, I thought I'd post a brief note about the experience. overall it was an interesting experience; although my first two days could have been considered mind-numbingly dull. however, the jury assembly room was a fascinating place to watch people. it is so interesting how quickly folks create little social networks and also how we tend to lay claim to specific bits of 'real estate' - I saw that most people returned to the same seats day after day. as a person who loves to read, I never complain about having big expanses of time on my hand. I read a really interesting book which transported me far, far away from cleveland to the wilds of tibet. the first day of jury duty I left my camera at home, at lunch time, we broke for lunch and I went out and wandered about the city, of course I was kicking myself for leaving my camera home as cleveland was shining like a brand new penny. on day two I did bring my camera with me. on day three I planned ahead and along with my camera, I brought two books, a deck of cards, and scrabble cubes. of course, as one would predict, this was the day my name was called. my named was called and I was also selected served on a jury. I sat on a civil case and fortunately it only lasted a couple days. after not being called during the first two days, I had a dreadful thought that if I did get called on the last day, I would end up on a jury for some complex case and end up sequestered away for weeks. it seems as if most of the potential jurors all had this same fear! 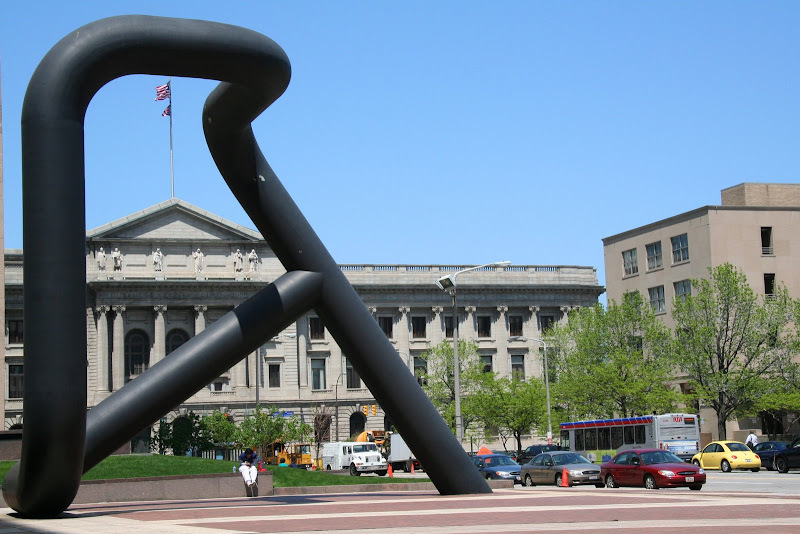 original cuyahoga county courthouse framed inside isamu noguchi's monumental abstract sculpture entitled 'portal' - I particularly like how the piece changes shape as you move around it or change your viewing angle. did I say sitting in the jury assembly room could be considered mind-numbing? I couldn't resist snapping this pic inside the room of sleeping people. I thought it was so funny how some people choose to sit in the little coat cubbies. 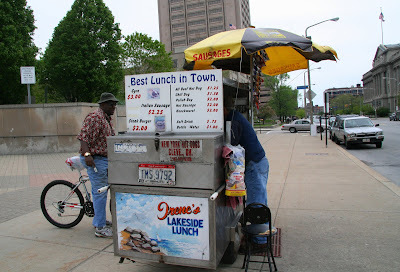 I don't know if I would say this was the 'best lunch in town' but it certainly was the cheapest place to grab a bite! the tall building in the background is the cleveland justice center which houses both the cleveland police headquarters and most of the courthouses for the cuyahoga county court of common pleas. warren zevon singing lawyers, guns, and money. the song appears on warren's 1978 album excitable boy. warren was a brilliant light which was extinguished way too soon, he died in 2003 at the age of 56 of inoperable mesothelioma (a form of cancer associated with exposure to asbestos). 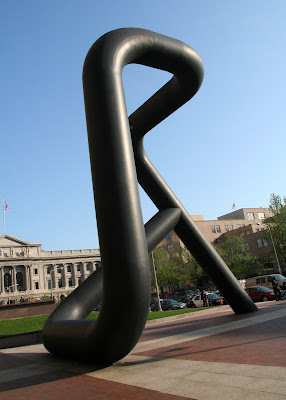 I like the sculpture + it would be handy as a bicycle stand or for attaching huge handcuffs, if required. I really hope this is not the best meal available in your town. Really. Too bad about that waitress. Poor Warren. That photo you took inside the courtroom shocked me for a moment. I thought they kept you all in little boxes. I'm glad to see that sitting in a box was voluntary. I have jury duty this coming Thursday. Out here in Hooterville we only have to report for one day. If you are selected the first day, you serve on a trial. Otherwise you get to go home. I love those little food carts. They don't allow them in Newport, but up in Providence they're all over the place. you're right, Warren Zevon was taken from us far too early! Glad you got some quality reading time in while doing your civic duty. I weigh in on the side of sausage stands too. Interesting to get your take on jury duty, which somehow I've managed to avoid. & I was a Warren Zevon fan too. The coat cubbies picture does have "mind numbingly dull" written all over it! A co-worker was on jury duty for the county at the same time you were but she was picked for a case on day 1 and it lasted 3 days, so not much chance for the 2 of you to meet. Ah well, maybe another time. Sorry to have missed Hessler St fair - weekend was way too packed. Hope you had fun! Who sings that song "Police and thieves in the street"?? It's a reggae song. I should try to find it on youtube - it would be another fitting vid to go along with your experience. If the jury system really worked, wouldn't we all be excited and proud to serve? But we all dread it. What does that say about our system of "justice" ?? Here's the Clash version.They sure weren't very good live performers, were they? Love their music though. mar azul....good luck with the new site! rest assured there are lots of wonderful meals to be head around and about. sandra - I was so cracking up when I noticed the people sleeping in the coat cubbies, but the noise was reduced! merle - good luck...keep us posted. the hooterville system seems to be the norm..but the cuyahoga county courts are terribly busy (40 courts can be running at any one time) so they need a lot of potential jurors! roy - I know hot dogs are NOT good for you, but I can't resist them from these carts...that and I love chatting up the cart vendors! john - only other time I was called was 30+ years ago and I wasn't chosen. so who knows as long as you are a registered voter you name is bound to come up! willow.... the cubbies where such a hoot! eth - we need to make a date!!! time for a backyard party on avenue c...will have to see if we can get the north carolinians up!! Mind numbingly boring I think was how Clare described her 2 days awaiting selection. She's a reader too so it saved her! Why on earth would you voluntarily sit in a little cubicle when you can watch the passing parade. I'm such a snoop! I've managed to avoid it thus far being the single parent of kids under 18 . . no such sanctuary now that they're 22 and 24! love, love, love junior murvin!! after being released from duty 3 times, last year i finally served in a civil case, like you, and found it very interesting, and thankfully short. i think this is my favorite of Zevon's songs...he was a great lyricist. I actually really liked my experiences serving on a jury. I got called for a criminal trial and it was fascinating. Fortunately, it only lasted about a week, and ultimately, we acquitted the defendant.